Posted On January 12, 2015 by Team iCynosure. Style is a perfect combination of being you while standing out in a crowd. So if you are a out-there person, you must check out what Sheena Sitlani has in store for you at her personal label that goes by her name. She dabbles in clothing, accessories and footwear, all statement pieces. Each product oozes elements of youth, filled with fun and quirk at the same time and perfect for the fashionable you. After gaining experience in the fashion industry and running her own show since 2008, her interests grew in a more creative collaboration for styling whilst designing. Having worked with numerous prestigious production houses and movies like Wake Up Sid, Mujhse Fraandship Karoge, Nautanki Salla, Aashiqui 2 and the much-talked about successfully running film Happy New Year, Sheena is always branching out into more avenues. Apart from styling for commercials, she has dolled up celebrities for red carpet events and styled high street fashion brand ‘Buffalo Jeans’ and contemporary fashion brand ‘Le Chateau’ in Toronto, Canada. 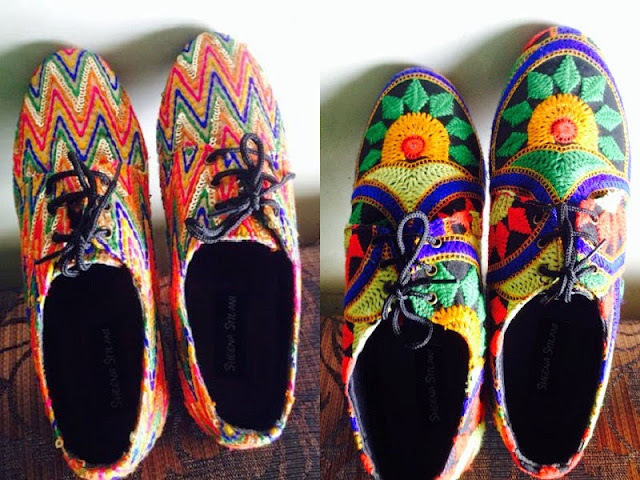 Here’s a glimpse of what she has in store for us… I’m especially in love with her amazingly handcrafted footwear. As a much sought after Bollywood stylist, Sheena Sitlani’s creations are full of vibrant colours and prints. So don’t fret, as there is something for everyone. Want to feast your eyes? Check Sheena’s Facebook Page here or follow her on instagram here. Which is your favorite piece? Leave me your comments below.